When kids feel moved to help someone feel better, they’re not simply being good humans: They’re actually putting life skills like compassion, empathy, and caring into action. And the more opportunities they have to practice them, the more natural that helper instinct becomes. And notice that we said practice: These aren’t skills that you’re just born with. They have to develop. You may very well have to prompt kids every. single. time. to think about someone who might be sick or feeling a bit blue, and that’s absolutely ok. One day, they will reach out all on their own! In the meantime, it helps to have a few easy ways for kids to brighten up someone’s day. If time is tight, simply download our color-in feel-better card, print it on card stock, and let the kids get busy decorating. Got a few more minutes? 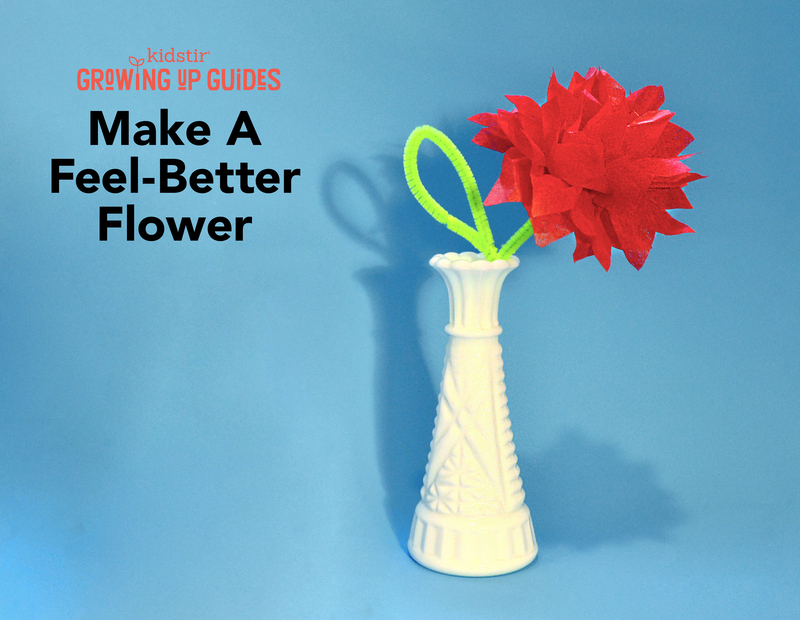 Whip up a simple tissue-paper flower—or an entire bouquet! Download step-by-step photo instructions or just follow along below. 1. Neatly stack the tissue. Starting at one edge, fold the layers up about half an inch. 2. Flip the stack over, and fold again, making sure to line up the folded edges. 3. Continue folding and flipping until you reach the end. It should look a bit like a folded fan. 4. Hold the folded layers together and pinch the middle. Tightly twist on the pipe cleaner. (It will look like a bowtie.) Snip off the corners. 5. Starting on one side, carefully separate the layers, pulling the top ones up and the bottom ones down. Fluff as you go! 6. Snip off a few inches from the bottom of the pipe cleaner, and twist it into a leaf shape. Attach to the stem. Read “Kids Helping Kids” for more on raising kids who care.